The following are the results of the Taber Viper Swim Club’s showing at the Alberta Summer Swimming Association (ASSA) Region “F” Championship Meet on Aug. 10-12. Twenty members of the club competed at the meet over the weekend, which was held at the Max Bell Regional Aquatic Centre in Lethbridge. A field of 10 competing clubs were involved, including the Brooks Barracudas, Claresholm Kraken, Crowsnest Pass Piranhas, Fort MacLeod Swim Club, Lethbridge Orcas, Nanton Marlins, Pincher Creek Dolphins, Raymond Swim Club, and the SASG (Southern Alberta Summer Games) Club. 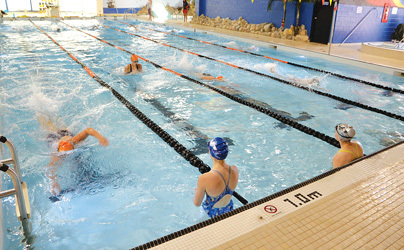 Provincial qualifiers from the Taber Viper Swim Club will compete in Edmonton on Aug. 17 for a three-day meet. Jessica Anderson, Girls Age 13&14: 100 Fly (1:23.88, first); 100 Fly (1:16.99, first), 100 Back (1:17.79, second); 50 Back (36.49, second); 100 Back (1:21.85, third); 50 Back (35.64, third); 50 Fly (32.80, fourth); 50 Fly (34.46, fourth). Kaylee Bruce, Girls Age 6&U: 50 Back (1:34.26, ninth); 25 Free (36.12, tenth); 25 Back (38.94, twelfth). Morgan Bruce, Girls Age 7&8: 25 Fly (28.75, third); 25 Fly (26.25, third); 100 IM (2:07.23, third); 100 IM (2:08.27, third); 25 Back (24.26, fifth); 25 Back (24.87, sixth); 25 Free (21.26, sixth); 25 Free (21.56, eighth). Jenna Clarke, Girls Age 15-17: 200 IM (3:38.47, third); 200 IM (3:38.38, third); 200 Free (3:11.38, sixth); 200 Free (3:16.91, sixth). Jordyn Clarke, Girls Age 17&U: 1500 Free (29:21.50, second). Ainsley Duell, Girls Age 11&12: 50 Breast (44.27, fourth); 100 Breast (1:38.31, fourth); 100 Breast (1:39.36, fourth); 100 Free (1:24.72, fifth); 50 Breast (44.94, sixth); 50 Free (37.14, sixth); 100 Free (1:25.42, seventh); 50 Free (38.18, eighth). Kade Haslam, Boys Age 7&8: 50 Free (56.19, fifth); 50 Back (57.35, fifth); 50 Back (57.13, fifth). Paige Hofer, Girls Age 11&12: 200 IM (3:46.50, fifth); 200 IM (3:34.77, fifth); 100 IM 1:40.77, seventh); 200 Free (3:16.50, seventh); 100 IM (1:41.80, seventh); 200 Free (3:22.38, seventh). Bennett Hughes, Boys Age 7&8: 50 Free (1:02.40, seventh); 50 Free (1:00.13, seventh). Carson Hughes, Boys Age 11&12: 100 IM (1:58.67, fifth); 50 Breast (59.22, sixth); 50 Breast (58.65, seventh). Thatcher Hughes, Boys Age 13&14: 100 Free (1:23.81, sixth); 100 Free (1:25.22, sixth); 100 IM (1:37.30, ninth). Addyson Hunter, Girls Age 7&8: 50 Back (1:14.72, thirteenth); 50 Free (1:12.85, fourteenth); 25 Free (28.12, sixteenth). Evan Klemen, Boys Age 11&12: 50 Free (34.43, second); 100 Free (1:21.30, second); 100 Back (1:29.95, second); 50 Free (35.32, second); 100 Free (1:20.67, second); 100 Back (1:31.61, third); 50 Back (44.17, third); 50 Back (42.79, third). Kayleigh Klemen, Girls Age 11&12: 50 Back (41.01, third); 100 Free (1:20.97, fourth); 100 Free (1:19.51, fourth); 50 Free (34.97, fifth); 100 Back (1:29.83, fifth); 50 Back (40.42, fifth); 50 Free (35.02, fifth); 100 Back (1:30.68, sixth). Katelynne Kormos, Girls Age 7&8: 25 Fly (31.09, fifth); 25 Fly (30.15, sixth); 25 Breast (34.26, tenth). Taryn Kormos, Girls Age 6&U: 50 Back (1:34.11, eighth); 50 Back (1:28.83, eighth); 25 Back (35.38, tenth); 25 Free (45.61, fourteenth). Mikayla Kress, Girls Age 7&8: 50 Back (55.76, third); 25 Back (24.55, fifth); 50 Back (57.36, fifth); 25 Back (25.16, sixth); 25 Breast (34.08, ninth); 25 Free (22.52, ninth). Tayla Silver, Girls Age 13&14: 50 Fly (33.57, first); 50 Back (36.48, first); 100 Free (1:11.17, second); 50 Fly (32.16, second); 100 Back (1:21.82, second), 100 Free (1:09.25, third); 100 Back (1:21.57, third); 50 Back (36.17, fourth). Ryder Unrau, Boys Age 7&8: 50 Free (45.53, fourth); 50 Free (47.25, fourth); 25 Back (28.69, sixth); 25 Free (21.87, seventh); 25 Free (22.09, seventh); 25 Back (29.35, seventh). Dion Valarde, Boys Age 13&14: 100 Back (1:18.79, first); 100 Back (1:18.16, second); 100 IM (1:19.93, third); 50 Fly (35.32, fourth); 50 Back (36.23, fourth); 50 Back (35.17, fifth); 100 IM (1:21.04, fifth); 50 Fly (35.09, sixth). Don Velarde, Boys Age 9&10: 25 Back (22.13, second); 50 Back (46.28, second); 25 Back (21.50, second); 50 Back (46.09, second); 50 Free (41.87, fourth); 50 Free (41.62, fourth); 25 Breast (25.18, fifth); 25 Breast (25.47, fifth). Darci Wright, Girls Age 13&14: 50 Free (28.94, first); 100 Free (1:05.66, first); 50 Fly (32.14, first); 100 Free (1:08.92, first); 50 Fly (33.69, second); 50 Back (35.26, second); 50 Free (31.11, second); 50 Back (37.14, fourth).